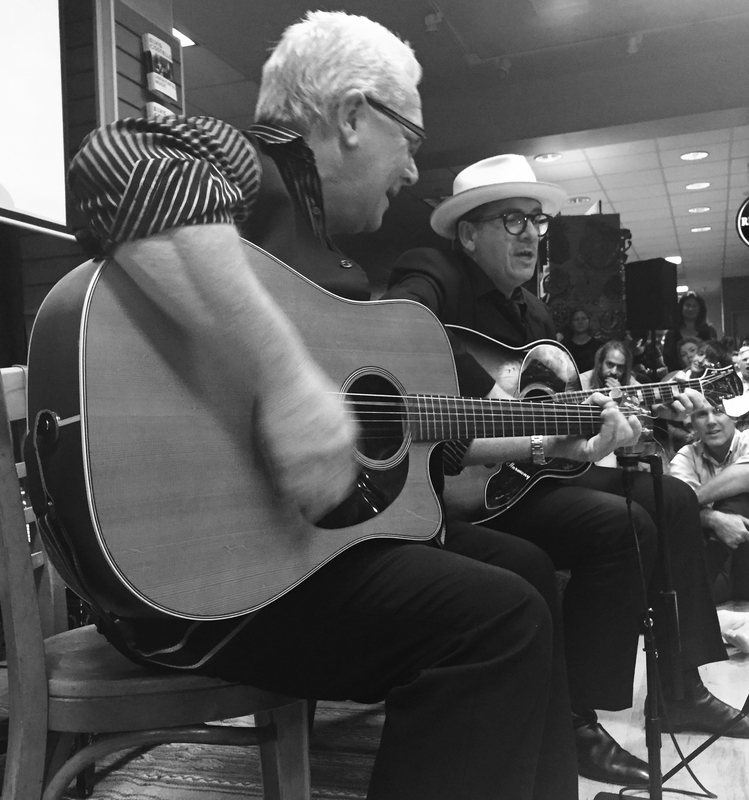 Elvis Costello was the featured guest for an interview with Evan Smith at Book People in Austin, Texas on October 20, 2015. Recently, Costello wrote a memoir titled Unfaithful Music & Disappearing Ink. This exclusive interview was part of his book tour. Entering the room with a light-colored hat, dark suit and vest, black-framed glasses, one gold ring on each hand and slick, black leather shoes: Elvis Costello descended the stairwell from the third floor to discuss the book and his life lived in music thus far. The entire second floor of Book People was filled with attendees and so many people were present that quite a few were listening in the back without a view of Elvis Costello; only able to hear voices echoing over the microphones. Fortunately I was able to grab a front row seat and sit on the floor. Music is clearly the anthem of his life and the focus of his career. He’s been part of the industry over 40 years. The book is a collection of memoirs entailing his entire life, with a emphasis on his career. During the interview Elvis Costello answered numerous questions and mentioned various musical stories regarding Paul McCartney, The Beatles, T Bone Burnett, Tony Byrne, Jimmie Vaughan, and Jimi Hendrix. Reluctantly, he even rehashed the old SNL incident back in December 1977 that got him banned from the show for nearly 12 years. Additionally, he spoke of his favorite gigs played in Austin and the time they performed at the Armadillo Festival in 1978. To much delight, Costello was also very open and willing to share the more personal stories of his past about family, his love and lust for women, or the curse of memory. Costello mentioned that memory, and the fear of losing memory, were two strong factors that compelled him to write the book. He discussed the long process of writing his autobiography and how the process was simplified with the patient support of his wife through her assistance to help organize old memories. Many of his relatives, he said, suffered dementia and Costello didn’t want any memories stolen away in the event that time or health altered his mind. Unafraid to go behind-the-scenes and express life offstage, it was interesting to listen to him speak about how he’s changed over several decades from when he began his musical career as a young man in his 20’s until now in his 60’s. “I wanted my stories to be told by me, in accuracy. I didn’t want them retold in a way that didn’t hold true to my life,” he stated to Evan Smith. In regards to Elvis Costello’s past, the topic of family and his memories of childhood were predominant, reoccurring themes throughout the interview. Many old photographs of times past were presented on a large screen, even a heartfelt video of his father performing live on television and dancing on stage whilst singing “If I Had A Hammer”. Elvis Costello spoke fondly about both his parents and there was great love and adoration in his voice when he shared old memories and his love for family. Nonetheless, there was a huge emphasis on his father, Ross McManus, a well-known musician and trumpet player. In fact, Costello made a point to inform the audience that October 20th, that very day, was indeed his father’s birthday. A particularly poignant memory of childhood included Costello telling the audience how he peeked around the back of the TV as a small boy to see if he might find his father behind the machine, only to realize that his dad was on stage in a studio. I found those sorts of memories to be the most endearing because only a child could think someone or something could transform into a miniature size and fit inside a TV. Costello’s honesty and his ability to tell old memories as if he were reliving it that very moment humanized his life story and made the interview all the more refreshing to hear. 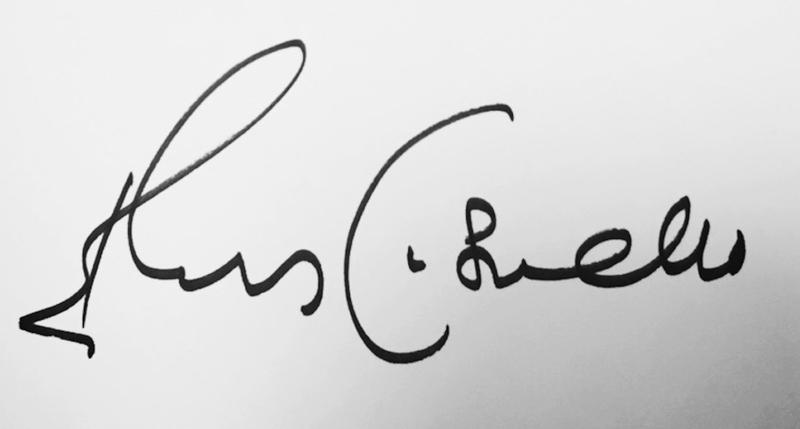 Growing up in a house of music, all my life I’d heard the name ‘Elvis Costello’ and I knew he was a musician, singer-songwriter and record producer from England. I knew he’d been inducted into the Rock and Roll Hall of Fame and I knew he’d been to Austin many times to perform. The city of Austin has always loved hosting Elvis Costello shows and over the past 20 years: I’d seen his name printed all over line-ups in the press. But to be quite frank, I really had no idea how in-depth his career was or how influential he was until this interview and until I began reading his memoir. Not only did I walk away that night learning and absorbing new insights about a famous musician born in Europe. That evening I became an Elvis Costello enthusiast. Just listening to the stories during the interview had me intrigued, eager to finish the rest of his book I’d only obtained one day prior to the event. However, the moment when he surprised us with live music and began to play “Everyday I Write the Book” and I heard those lyrics for the first time only a few feet away from Elvis Costello in the flesh and blood: I felt a strong connection to the music. I wanted to hear more. My heart was so deeply moved by the words in his lyrics that it almost made me want to cry, in a good way. Since then I’ve started to read many of his lyrics and it’s clear to me now why he’s become a global success for 40 years. Elvis Costello is an artist whom posses a distinct voice and an edge. An artist that followed his heart and writes from the heart. A one-of-a-kind artist with innate gifts of articulation, imagination and passion. Gifts that cannot be taught nor bought. 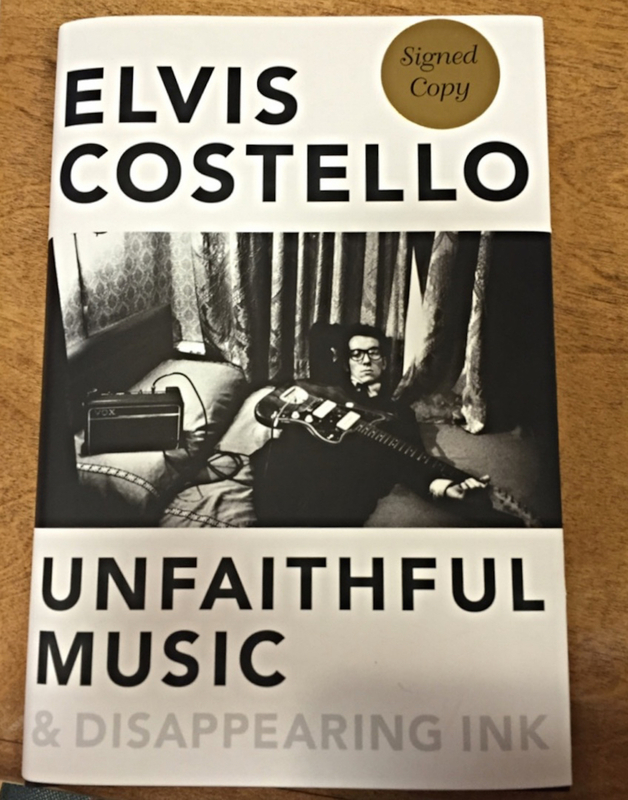 Furthermore, Costello read a few chapters from his newly released memoir, Unfaithful Music & Disappearing Ink. Ending the evening on a high note, that’s when he played a bit of live music for the audience. We even got a little history lesson about his guitar in-between songs. 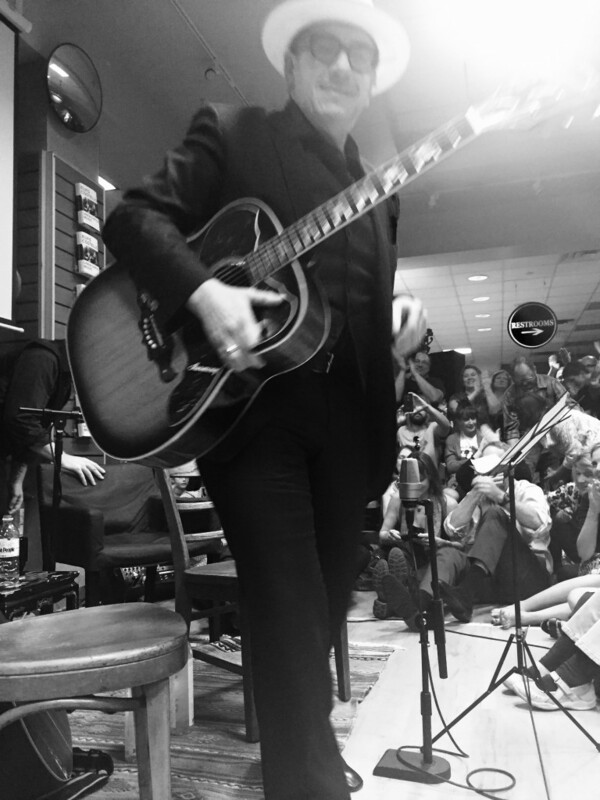 A short video of his performance that I recorded from my seat can be found here on YouTube: Elvis Costello playing music at Book People. Unfaithful Music & Disappearing Ink can be purchased online or at your local bookstore. For more information regarding Elvis Costello, his book tour, list of albums or other miscellany: please visit the website at www.elviscostello.com. Elvis Costello looking into the camera and holding his guitar whilst departing the interview stage at Book People in Austin, Texas on October 20, 2015. This entry was posted in Book Tour, Commentary, Event - Show - Festival, Featured Artist, Interview, Live Shots, Memoir, Photography, Reviews and tagged ATX, Austin Texas, Book People, Book Tour, Elvis Costello, England, Evan Smith, Jimi Hendrix, Jimmie Vaughan, London, Lyrics, Memoir, Music, musician, Nicolette Mallow, Paul McCartney, producer, Rock N Roll, Ross McManus, SNL, songwriter, The Beatles, Unfaithful Music & Disappearing Ink. Bookmark the permalink.